During the Philadelphia region's recent cold spell, one horse found out the hard way that it's not a good idea to walk out onto a frozen pond. 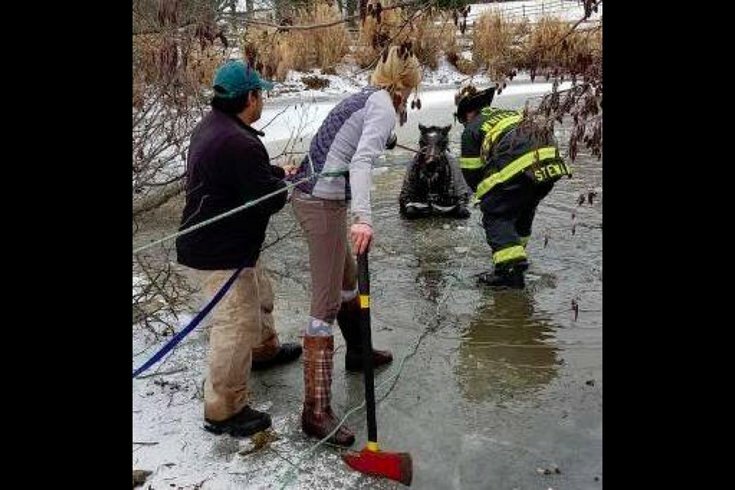 The East Whiteland Fire Company shared photos Tuesday of first responders rescuing a horse from an icy pond at a farm in Charlestown Township, Chester County. The horse's owners said the animal walked out over the frozen pond and fell through the ice. They solicited help from friends and neighbors but were unable to free the horse after trying for approximately an hour. Around 10:45 a.m., firefighters and Malvern EMS were dispatched to assist the rescue efforts. The horse was eventually pulled to safety after emergency crews broke up the ice to make a pathway. The horse was checked out by a veterinarian and is "doing well," according to fire officials.